Blog on the Indian Revolution. Everywhere on the ground lay sleeping natives — hundreds and hundreds. They lay stretched at full length and tightly wrapped in blankets, heads and all” — is how Mark Twain had discovered Mumbai slum more than a century ago. Many more heads have moved there for shelter since then and across cities. According to the last report of the National Sample Survey Organisation, one out of every seven urban households in India today live in slums. 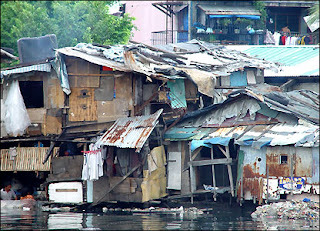 About eight million households live in slums now — two million more than those lived there a decade ago. Interestingly, the number of slums has declined somewhat during the period. But then, this must have increased the population density in the slums and has worsened the living conditions further in the absence of any significant improvement in basic amenities. Clearly so. More than half of the non-notified slums, which account for the larger part of the slums, did not have any latrine facility according to this survey. Underground drainage system existed in just 9% of these slums and underground sewerage was available to only 15%. This survey was conducted some five years ago but there is no reason to believe that living conditions in slums has improved in the mean time. These figures were, however, drowned in the glory of 8% GDP growth. The government left them to survive on trickling down effect of high economic growth. In fact, the amount of funds provided by the government under National Slum Development Programme (NSDP) has increased by just Rs 230 crore in last five years. The amount released under this scheme has increased from Rs 385 crore in 1999-00 to Rs 614 crore in 2004-05. In fact, a year ago in 2003-04, a sum of only Rs 335 crore was released under this scheme —less than that of 1999-00. The NSDP scheme has been discontinued since 2005-06 and in its place a new scheme, Jawahar Lal Nehru National Urban Renewal Mission has been launched in December, 2006. A lot of good things have been promised including improved housing, water supply and sanitation for urban poor under these schemes. The living conditions in slum has, however, worsened further on the mounting pressure of new entrants as the housing shortage in urban areas has galloped over the years. According to data provided by National Buildings Organisation, aggregate housing shortage in the country has increased by 134% during the last six years from 10.56 million units in 2001 to 24.71 million units in 2007. The number of urban households during this period has increased by 11.5 million. Many of them found their ways to slums for shelter. Predictably, Maharashtra which has the largest urban population has suffered most. The housing shortage in urban Maharashtra was estimated at 3.72 million units in 2007 — up by nearly three times from 1.34 million units in 2001. Tamil Nadu has the second-largest housing shortage at 2.82 million units in 2007 followed by Uttar Pradesh with 2.38 million units and West Bengal with 2.04 million units. Not surprising. For, while the demand for dwelling units is rising sharply following increase in number of households, the growth of construction of houses has lagged behind. Take for example, the construction of houses for economically weaker sections; a huge 1.14 lakh dwelling units were targeted to be constructed in 2006-07 but only 22,960 units were constructed up to August 2006. That is, only about a fifth of the target was achieved during the first five months. NOTE : The Comments section is provided in the interests of free speech only. It is mostly unmoderated, but comments that are off topic, offensive, slanderous, or otherwise annoying stand a chance of being deleted. The fact that any comment remains on the site IN NO WAY constitutes an endorsement by Naxal revolution, of any view expressed, fact alleged, or link provided in that comment. Make In India - Revolutionaries ! Thank you for visiting Naxal Revolution. . Travel theme. Powered by Blogger.